Welcome to Harley K Model, dedicated to the preservation and restoration of the 1952 to 1956 Harley-Davidson flathead unit‑construction motorcycles, With the alphabet soup of model designations, these bikes are affectionately known as the “K models”. 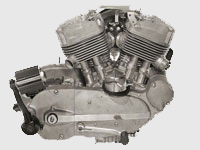 We also cover the early Sportster models through 1969, as these are essentially K Models with overhead valves. The Ks and early Sportsters share many components and service procedures. And many enthusiasts own both models. The OSKRG (Old Sportster and K Model Research Group) is a group of individuals who enjoy preserving the history of these motorcycles, so others can restore them correctly, and keep them alive and running. Southeast Asia Police model, 1959-1967 ?